I have a whole lot of love for board sports (I used to live on a Wakeboard) as well as gaming franchises such as Skate, Cool Boarders and well… anything that allowed me to express myself with a board. So with that in mind, I was quite excited to finally get my hands on Ubisoft’s Steep to see if it could deliver the same sort of exploration and freedom of expression that I’d been missing ever since the Skate franchise went to sleep. 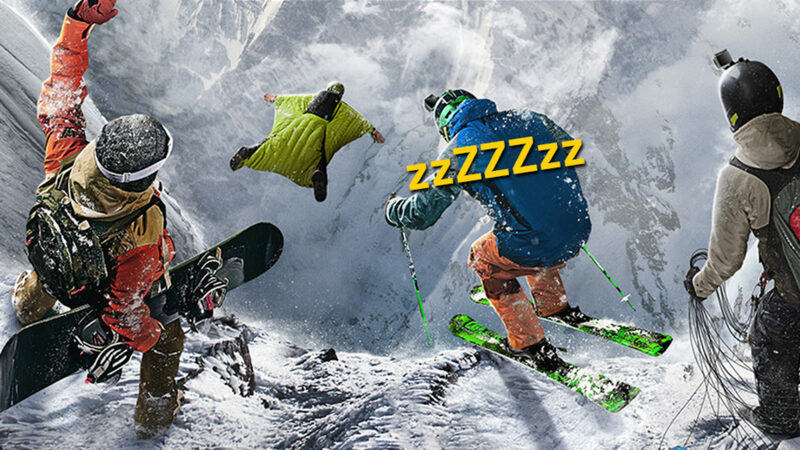 To properly get into this review in progress, I can tell you that I’m roughly 1.5 – 2 hours into Steep and I must unfortunately report that despite it being quite pretty to look at, it’s mostly felt like the polar opposite of everything I loved about those other games. While the idea behind the game made me feel like I would be out adventuring in the mountains, the game progression has very quickly turned into nothing more than a series of events popping up on my map that I’m just ticking off one by one. That wouldn’t be so bad if the gameplay was really slick, but that’s not going down so well either. The controls feel clunky and it just constantly feels like I am stuck in the mud or fighting against the snow or the weight of my character. It’s tough to express yourself and enjoy the boarding or skiing when you really just feel like its a tall order to even align yourself properly for a jump. I want to feel free, not… not this. The squirrel suit and paragliding stuff also makes you feel like you are just constantly fighting the controls and really haven’t been thought through. Why would I want to be continually pulling up during a flight for the duration of an entire event just to keep myself going straight. It’s a case of not understanding the difference between enjoyable gameplay and how the world damn well works. We get it. It was also pretty frustrating to be locked out of the game earlier tonight because my internet was down, and the game required that I be logged into their servers – almost entirely because I have very little interest in the online functionality they are trying to shoehorn in at the moment and they’ve gone and made the entire game an online only title. I’m just not entirely sure who this game has been designed for, and the intensely cringeworthy bits of speech that come out of your characters mouth feel so awkward and detached from the target audience that I really just thought “if this guy howls like a wolf one more time, or exclaims something like ‘this is living! '” I’m going to drown my character in the snow. I’ll find a way. There isn’t even any humour to it. You absolutely panel your face into a rock, and when you retry the event your character says something abysmally lame like “woah, I haven’t had a fall like that in a while”. I had, about 20 seconds before that. Ugh. The long and the short of it all, is that I’m barely a few hours in and I just… well, I just don’t want to play anymore. I’m totally not convinced and with the lack of early reviews I feel compelled to get the message out as quickly as possible that hey, this just really isn’t great. I will still be putting more time into it for the final review, but if it wasn’t for that requirement, I’d happily pack up shop and not return. It’s not terrible, it just really isn’t much fun. Steep? The only thing looking steep to me right now, is the asking price.